What Dog Breed Lives The Longest And Why Don't Dogs Live Longer? You are here: Home / Breeds / What Dog Breed Lives The Longest And Why Don’t Dogs Live Longer? What dog breed lives the longest? Should longevity play a role in the decision-making process when choosing your next dog? The average lifespan of all dogs is around 10 to 13 years. But this can vary greatly (anywhere from 7 years to 16 years) depending on the breed, size, and overall health of an individual dog. We’ll look at what the experts say about the longest living dog breeds, small and large, as well as what you can do as a responsible owner to make sure that your own dog lives a long and healthy life. A dog’s longevity is strongly associated with size. Small breeds have the longest lifespans, followed by medium and then large sized breeds. Certain giant breeds can have the shortest average lifespans. Why do small breed dogs generally live longer lives than large breed dogs? Scientists have found that the aging process is more rapid in large dogs than in small dogs. They suspect this may be because rapid physical growth in youth triggers accelerated aging (and its associated health issues) in adulthood. Small breed dogs don’t show the same rapid aging as larger dogs. This explains why some of the longest living dog breeds are small or medium-sized. So, do we know what dog breed lives the longest? Both size and breed type can play an important role in longevity. Small to medium-sized dogs tend to live longer than large to giant breeds. But are there any big dog breeds that live long? Fans of very large dogs should understand that they generally do have shorter lifespans than smaller dogs. What large breeds are more likely to live beyond the low end of the average age range scale? 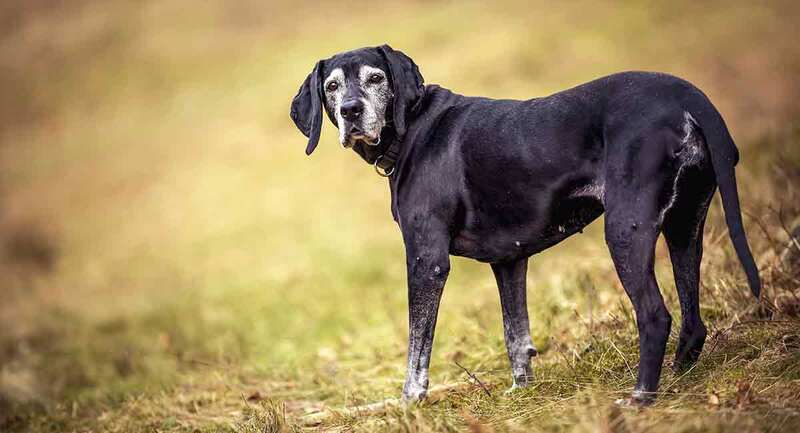 While the higher risk large dogs have a lifespan in the 8 to 10-year range, the longer-lived large dogs have a lifespan in the 11 to 14-year range. If longevity is associated with size, then shouldn’t toy dog breeds have the longest lifespans? In some cases, they do, but it’s important to remember that overall breed health is as important as size when it comes to longevity. Certain toy breeds, especially those with flattened muzzles and other extreme physical characteristics can have health issues that lead to shorter lifespans. What Dog Breed Lives the Longest? An Australian Cattle Dog named Bluey is thought to be the longest living dog in the world. Bluey lived to over 29 years of age. There are other famous dogs that lived into their late twenties, all of them were in the small to medium-size range. While there’s no guarantee that your dog will make the record books, there are many things you can do to ensure that your dog lives a long life. Breed and breed group matters when it comes to choosing a dog breed with the longest lifespan. Breeds created for a specific work function tend to be healthier than those bred for their appearance. tend to have more robust health than those bred for their interesting looks. As an example of how appearance can impact health, they point to the modern-day English Bulldog, which suffers from a number of serious health problems due to the structure of its head, face, and body. Bulldogs and other flat nosed breeds can suffer from a chronic condition called brachycephalic obstructive airway syndrome because of the way their heads, muzzles, and throats are shaped. These chronic health conditions can lead to shorter lifespans. For example, a brachycephalic dog can collapse during exercise and intervertebral disc disease can lead to paralysis and the decision to euthanize. In contrast, dogs bred for their ability to work hard under difficult conditions (such as a herding dog like Bluey the long-lived Australian Cattle Dog) do tend to have more robust health and longer lifespans. Of course, working dogs can suffer from health problems too, but overall, they need to be strong and healthy to perform the jobs they were designed to do. What dog breed lives the longest can also be affected by the diversity in the breed’s gene pool. Genetic diversity leads to better health and longer life than inbreeding. The English Bulldog serves as a good example of this as well. The Bulldog has a small founder population and low genetic diversity. Focused selection for the dog’s unique physical appearance has also led to genetic bottlenecks that could eventually lead to the failure of the breed to survive. Other purebred dogs have genetic health problems as well. But breeds with more genetic diversity have better health and longer lifespans than dogs with low genetic diversity and serious inherited health problems. Today’s breeders are more aware of the importance of genetic variation than they were in the past. Dog breed organizations are actively promoting good breeding practices that increase genetic diversity in purebred dogs. Since most purebred dogs will have some risk of inheriting one or more health problems, is there anything you can do to choose a healthy puppy that will live a long life? The most important thing you can do is to work with a responsible breeder who tests their dogs for inherited health conditions. There are DNA tests for many serious inherited health problems, including diseases of the eyes, heart, blood, and brain. Other problems, such as hip and elbow dysplasia, can be discovered through physical examinations and diagnostic tests performed by veterinary specialists. Health test results are certified and maintained by a canine health registry like the Orthopedic Foundation for Animals. As we’ve seen, there are many dog breeds to choose from if you’re interested in a dog that will live a long and healthy life. Small to medium sized dogs with more natural appearances that come from working breed groups are a good bet. Be sure to choose a breeder who health tests all their breeding stock for inherited health conditions. What else can you do as a responsible owner? Take your dog to the vet for regular checkups and preventive health care like dental cleanings. Feed your dog a high-quality diet and keep her at a healthy weight. Regular exercise will also keep your dog fit. Spaying and neutering will help prevent certain reproductive health problems, including cancers and pyometra (uterine infection). Here’s to a long and healthy friendship for you and your canine companion! Has your dog reached a ripe old age? Let us know below! Selman, C., Nussey, D.H., Monaghan, P., 2013, Ageing: It’s a Dog’s Life. Current Biology. Lewis, T.W., Wiles, B.M., Llewellyn-Zaidi, A.M., et al., 2018, Longevity and Mortality in Kennel Club Registered Dog Breeds in the UK in 2014. Canine Genetics and Epidemiology. Egenvall, A., Bonnett, B.N., Hedhammar, A., et al., 2005, Mortality in Over 350,000 Insured Swedish Dogs from 1995–2000: II. Breed-Specific Age and Survival Patterns and Relative Risk for Causes of Death. Acta Veterinaria Scandinavica. Pedersen, N., Pooch, A.S., Liu, H., 2016, A Genetic Assessment of the English Bulldog. Canine Genetics and Epidemiology. Lewis, T.W., Abhayaratne, B.M., Blott, S.C., 2015, Trends in Genetic Diversity for all Kennel Club Registered Pedigree Dog Breeds. Canine Genetics and Epidemiology.